Last month, a group of Workday customers, partners, and employees competed in a challenge that encourages innovation, collaboration, and the consumption of probably a little too much caffeine and junk food: the Hackathon at Workday Altitude. Participants coded for up to 24 continuous hours in a Las Vegas hotel ballroom at Workday Altitude, our annual professional services conference that drew nearly 2,000 attendees this year. Fueled by unlimited pizza and soda, teams worked around the clock to build fun and novel extensions to Workday applications using the Workday technology stack. The competition was fierce and participants stuck it out until the end—to pull through, some took nap breaks under tables, using tablecloths as makeshift blankets. “We had engineers that develop our products, partners that help deploy them, and customers that use them on a daily basis, all coming together with their separate points of view,” says Armin Taghinia, director of software development engineering at Workday and Hackathon organizer. 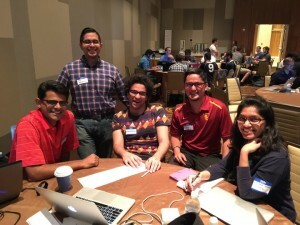 Members of a Workday Altitude Hackathon team looking confident about their project. A strong desire to win didn’t stop participants from helping one another, says Taghinia. For example, when one team raised an issue with its project, multiple members of other teams jumped in with advice and assistance. “The Hackathon at Workday Altitude, and its spirit of collaboration, is a great example of why the Workday ecosystem is unique in our industry,” says Jim Bozzini, executive vice president, customer operations at Workday. While it was the only Workday Altitude event that resulted in sleep deprivation, it was just one of many where partner firms and members of Workday’s professional services organization worked together to build upon Workday’s industry leading customer experiences, Bozzini notes. At the conclusion of the Hackathon, the judges’ criteria for evaluating each project hinged on its potential customer benefit. In fact, participants were informed their ideas may be shared with the broader Workday community if they demonstrated potential for use beyond the event. Rounding out judges’ criteria was the coolness factor of each project. First Place: Team Teal, comprised of five people from a Workday customer organization, for a new approach to employee recognition, including feedback tools that would support it. Second Place: Sunday League, including a Workday employee, members of a Workday customer organization, and a someone from a partner organization, for its integration visualization tool. Third Place: The Champs, comprised of multiple partners and someone from a Workday customer organization, for a tool that automatically determines the correct taxation for remote workers.